Sprouting is at the core of our bakery. We believe in real bread – rich in nutrients and free from additives, chemicals and GMO’s. We produce our breads by imitating the natural sprouting process of seeds in nature. Rather than using a flour, our breads are made from activated and sprouted whole grains and seeds. When we unlock the nutrients available in our food through sprouting, we make it easier for our bodies to digest and use those nutrients to increase our energy, boost our immune system, regulate hormones, improve gut health and so much more. Our process is simple but takes time and patience to perfect. The result is easily digestible, nutrient and flavour dense bread that’s actually good for you. For almost 30 years, the Anderson family has produced Australia original sprouted breads in the idyllic seaside town of Yamba on the NSW North Coast. Our certified biodynamic and organic wholefood products are a reflection of our passion for health and plant-based nutrition. Our commitment to clean food stems from the farm to the plate. 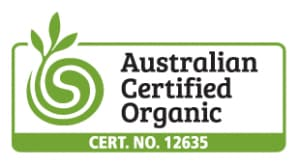 This means sourcing the most premium ingredients while supporting long-term relationships with our local Australian farmers who practice sustainable farming methods.